The inherent armature resistance ra being small, speed n versus armature current Ia characteristic will be a straight line with a small negative slope In the discussion to follow we shall not disturb the field current from its rated value. At no load (i.e., Ia = 0) speed is highest and Note that for shunt motor voltage applied to the field and armature circuit are same and equal to the supply voltage V. However, as the motor is loaded, Iara drop increases making speed a little less than the no load speed n0. For a well designed shunt motor this drop in speed is small and about 3 to 5% with respect to no load speed. This drop in speed from no load to full load condition expressed as a percentage of no load speed is called the inherent speed regulation of the motor. It is for this reason, a d.c shunt motor is said to be practically a constant speed motor (with no external armature resistance connected) since speed drops by a small amount from no load to full load condition. If we vary If, flux φ will change, hence speed will vary. To change If an external resistance is connected in series with the field windings. The field coil produces rated flux when no external resistance is connected and rated voltage is applied across field coil. It should be understood that we can only decrease flux from its rated value by adding external resistance. Thus the speed of the motor will rise as we decrease the field current and speed control above the base speed will be achieved. Speed versus armature current characteristic for two flux values φ and 1φ. Since 1<φφ, the no load speed 'on for flux value 1φ is more than the no load speed no corresponding to φ. However, this method will not be suitable for constant load torque. In this method of speed control, armature is supplied from a separate variable d.c voltage source, while the field is separately excited with fixed rated voltage . Here the armature resistance and field current are not varied. Since the no load speed N 0=Va/knφ, the speed versus Ia characteristic will shift parallely for different values of Va. As flux remains constant, this method is suitable for constant torque loads. 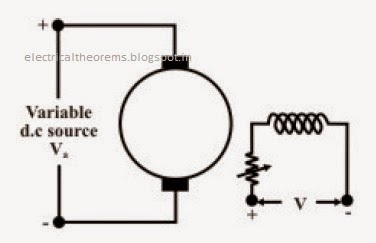 In a way armature voltage control method is similar to that of armature resistance control method except that the former one is much superior as no extra power loss takes place in the armature circuit. Armature voltage control method is adopted for controlling speed from base speed down to very small speed as one should not apply across the armature a voltage which is higher than the rated voltage. First the induction motor is started with generator field current zero (by adjusting the jockey positions of the rheostats). Field supply of the motor is switched on with motor field rheostat set to zero. The applied voltage to the motor Va, can now be gradually increased to the rated value by slowly increasing the generator field current. In this scheme, no starter is required for the d.c motor as the applied voltage to the armature is gradually increased. 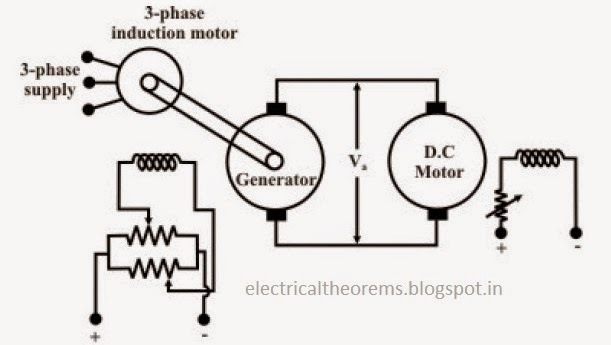 To control the speed of the d.c motor below base speed by armature voltage, excitation of the d.c generator is varied, while to control the speed above base speed field current of the d.c motor is varied maintaining constant Va. Reversal of direction of rotation of the motor can be obtained by adjusting jockeys of the generator field rheostats. Although, wide range smooth speed control is achieved, the cost involved is rather high as we require one additional d.c generator and a 3-phase induction motor of simialr rating as that of the d.c motor whose speed is intended to be controlled.